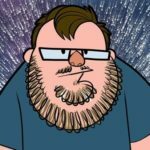 March 20, 2017 by Robin S.
I have been playing video games for as long as I can remember. I remember thinking Pac-Man on the Atari 2600 was probably the best game of all time (I was very young. Don’t judge me.). I remember getting our Commodore 64, and spending enough time playing Jeopardy on it that I could pretty much buzz in on every question, confident that I’d remember what the answer was (I don’t think there were many puzzles on that one). Later, Lemmings on the Super Nintendo was the ideal puzzle game, and Final Fantasy II (Final Fantasy IV in Japan and all modern incarnations) was the best RPG ever. All of these “best games ever”, though, pale in my memory when compared to Master of Orion 1. 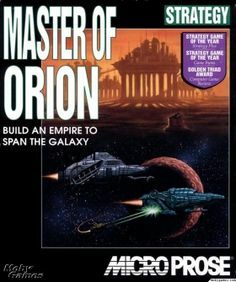 I remember stumbling across the Master of Orion box among the other computer games, though I couldn’t tell you what store we were in at the time. Honestly, it wasn’t that flashy compared to other games; it was a basic black box, with a generic sci-fi scene (ships above a planet) and the name printed on the side of the box without even a fancy font or logo. I must have played other strategy games and liked them, because “Strategy” is the only thing that stands out on that box to me now, but, honestly, I don’t really know what drew me to this one. To be honest, it’s been a few years since I’ve played Master of Orion, but not nearly as many years as you might think. Over the years, I have reverently moved the Master of Orion files from one external drive to another, periodically picking it up and playing a few games of Master of Orion, helping the Silicoids or the Psilons achieve their rightful places as the rulers of the entire galaxy. When I booted it up for this review, I wasn’t really worried that the graphics would look dated, or that I wouldn’t enjoy the gameplay, because it hasn’t been that long since I’ve played it. Even almost a quarter century later, the graphics are fine. They’re not flashy, but they don’t need to be. The same can’t entirely be said for the game play. Most of it is workable. I wish I could zoom in and out on the map, and it took me a while to remember that simply clicking on the map will refocus it on my cursor. I kept trying to drag, which led to unexpected behaviors when the map would simply recenter on the last point where my mouse button was down. Still, most of the management is done using sliders (see the screenshot to the right for just one set of sliders). Lots and lots and lots of sliders. Each planet’s spending priorities are controlled by slider. Research priorities are controlled by sliders. Espionage and infiltration? Slider. That’s not entirely a bad thing, since I prefer it to the way Master of Orion 2 did things (expect a review of that classic at a later date), but I suspect it would give the game kind of a clunky feel if one wasn’t compelled by nostalgia to love it as much as I do. The game itself is one of the models on which most future 4X games would be based. The term itself was coined for this game. You start off controlling a single planet, and you slowly explore and expand your empire, exploiting resources as you find them. Eventually, you’ll find other races among the stars, and, as a would-be galactic emperor is compelled to do, you will have to exterminate them. 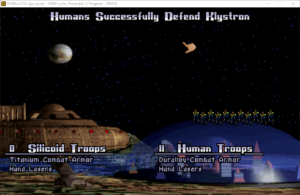 Where other games in the genre would eventually allow you to win through diplomacy and alliances (and those aspects are at play during any given playthrough of Master of Orion), the only winning condition for this game is to be the last empire standing. I hated this stupid GNN reporter. I’m pretty sure the inhabitants of Endoria that I haven’t evacuated yet probably hated him more, though. Because of that, Master of Orion is actually pretty simple, comparatively speaking. You build up the infrastructure on each planet, making sure to balance that with protecting the environment (unless you play as the Silicoids, who don’t really care about things like breathing or radiation). Eventually, those planets can earn research points, save money, or build ships. Researching can improve any aspect of this. Early on, increasing your ability to explore, expand and exploit is going to be your main focus, but there comes a time when any young emperor’s fancy turns to love extermination. When that time comes, you’re going to start building a fleet of ships intended for something more than defense. Ship design is pretty basic – you pick a size for the ship, pick one of the ship images, and decide what items to put in there. Available ship styles are dictated by the color of your flag and the size of the ship you’ve chosen. Engine, Armor, Weapons, Computers, and “special” items (like the colony ship unit that turns a ship into a colony ship) all fit inside. As your technology increases, you’ll have access to better and better items, and the existing items will get smaller and smaller. 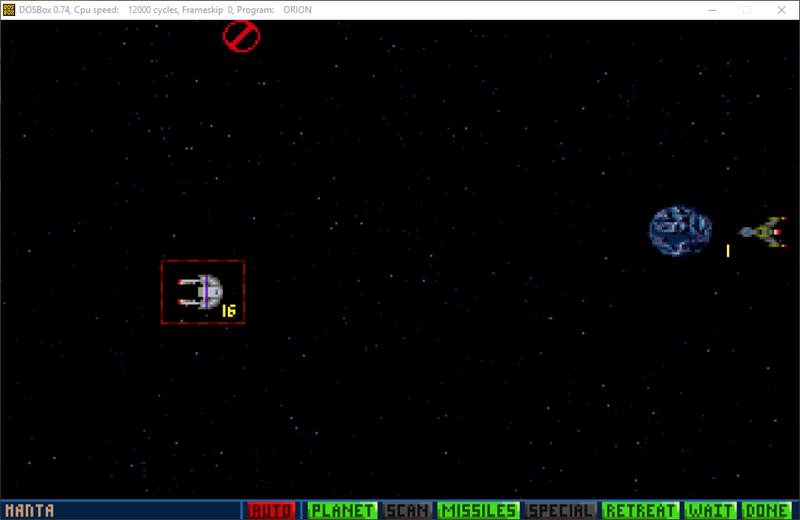 Space combat is strategic and turn-based, but pretty basic. 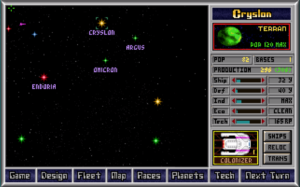 All space battles will take place in orbit around a star system, usually in orbit of the star’s primary planet (stars in Master of Orion have no more than one planet shown), or in empty space if the star has no planets. The attacking fleet will be stacked on the left, with the defending fleet stacked on the right. Since you can have six ship designs at a time, that means you have at most six icons on your side (unless it’s your planet, in which case you get to control the planet’s ground-based missiles as well. 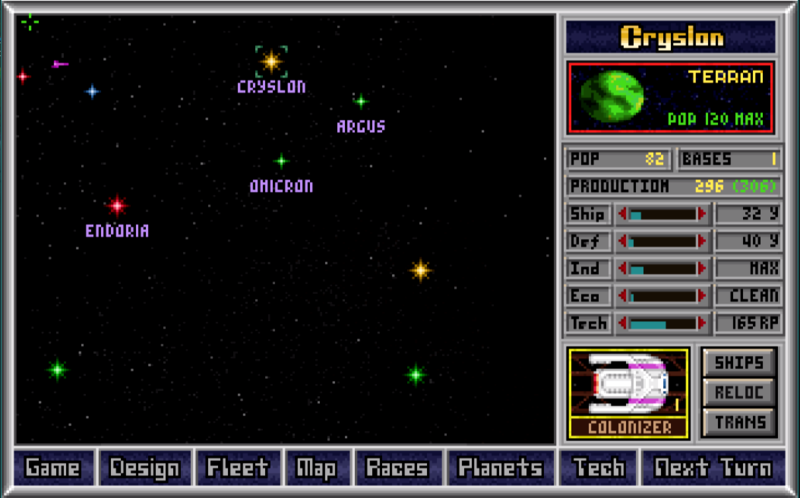 Battles are generally pretty quick; your ships can move one space for each “level” of engine they have, and the entire stack of ships fires at once. If your design includes a single set of missiles, but you’ve got a stack of 10 ships, then you’ll fire 10 missiles at a time from that stack. 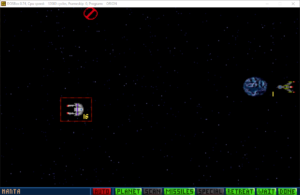 Beam weapons and missiles can be fired at separate targets, and, if you’re fighting against a planet, you may also use bombs to attack the planet. 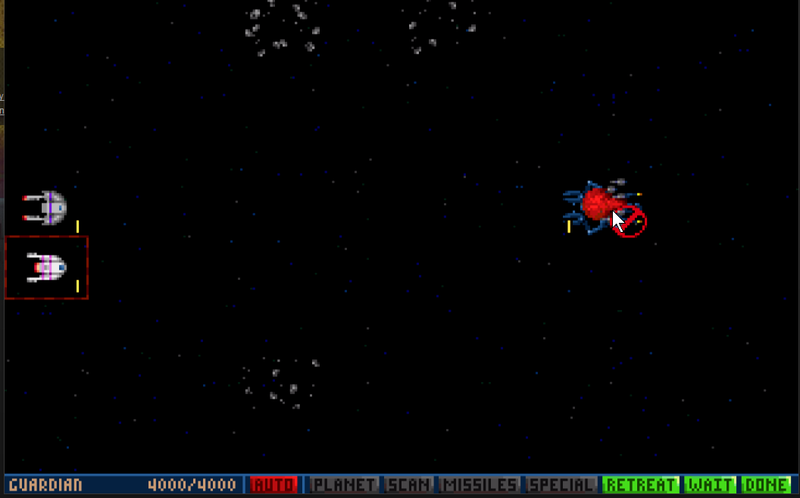 In addition to the playing through the strategic battle, you can click “AUTO” to simply watch the battle play out. Planetary invasions are even more basic than space combat. 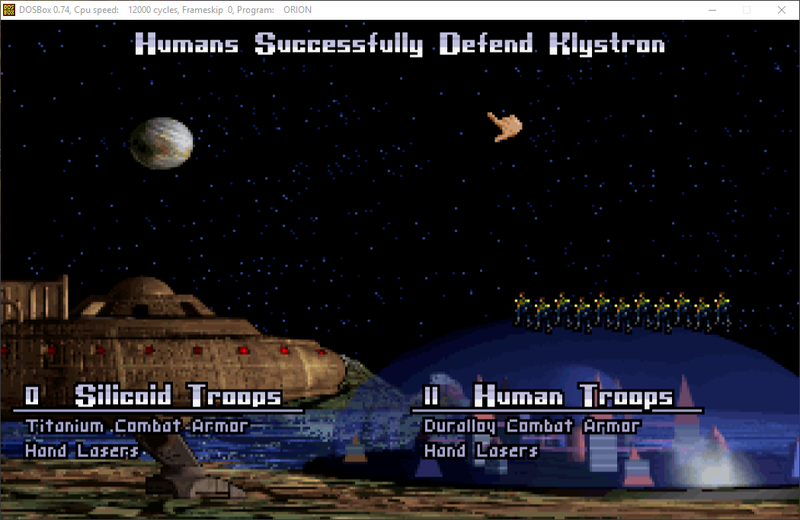 Once you’ve gotten rid of a planet’s defenders, you have to deal with any alien colonies that are in place. You could simply bomb them out of existence, but why not take advantage of the infrastructure your enemies have so kindly built up for you? You can simply transfer “colonists” straight to an enemy colony (even a single ship in orbit can send all your “colonists” to their doom, so you’ll want to leave a small fleet in orbit long enough to get your colonists delivered. Your colonists come equipped with the best weapons your technology can handle, and they’ll systematically clean up the planet of any pesky aliens before settling in (or, in the case of my screenshot to the left, they’ll die trying…). In addition to diplomacy and warmongering, you’ll have to face random events. These events aren’t quite as varied as in the next game in the series, but they do occasionally put some of your people at risk, with the all-too-cheerful GNN robot informing you that your people on a given planet are all going to die if you don’t do something. There are also good events (a random planetary realignment might boost a planet’s ecosystem, or you may find ancient ruins that will boost your research), but those seem to mostly be reserved for AI players. I’m pretty sure GNN is biased toward players of the computer variety. Also, somewhere, out there in the galaxy is Orion. 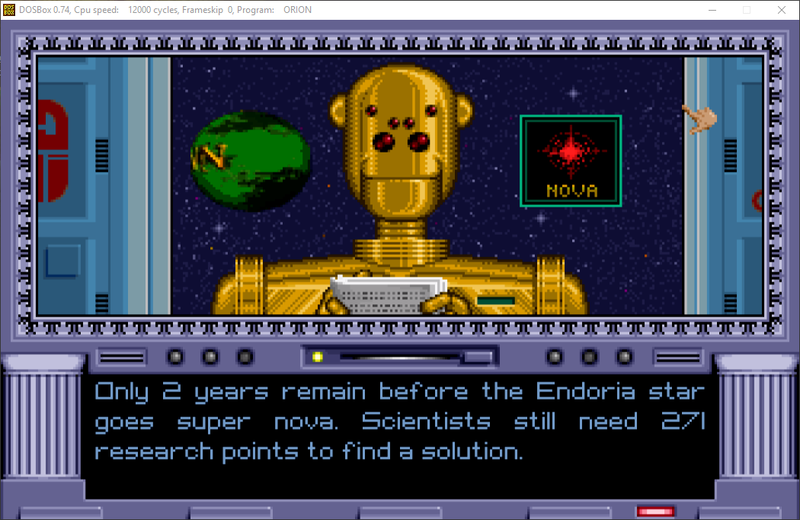 Orion is the homeworld of an ancient advanced race, patiently waiting for the first player to find it and plunder it for some of the best technology in the game, like the aptly-named Death Ray. The only thing between the player and the riches of Orion is the Guardian. You’ll have to build up a decent fleet with some good weaponry to take out the very well equipped Guardian. There are tricks to maximize your chances (it doesn’t do quite as well against swarms of smaller ships), but that’s not to say it’s easy. Master of Orion is now available on Steam for just a few dollars (I picked up Master of Orion and Master of Orion 2 for $5.99.). I can’t recommend either of the other two bundles, as they both include Master of Orion 3, which was a huge disappointment (I haven’t tried the remake yet, so I can’t speak to that). If you’ve any interest in 4X games and haven’t tried it, it’s definitely worth trying the game for which the term was coined. If you didn’t read that in something of a hushed, reverent tone, then you read it wrong. Go back and do it again. Then again, I’m kind of a product of this age, as well, so my bias may be showing here. This entry was posted in Reviews, Video Games and tagged Classic Video Games, Master of Orion, Nerdstalgia. Bookmark the permalink. I vote that news organizations today be made to report required resources in a point system.